For my first blog post, I am going back to where it all began for me. My first serious learning experiences in the field of horticulture began with house plants. My first experiment began with begonias that were given away by our Church every Easter. I was the willing recipient of my sisters' begonias too, trying courageously to keep them alive. I was in elementary school. Once home, I would put the begonias on my windowsill, water them every day like clockwork, and watch them die. I had no idea what I was doing, right or wrong. I guess I always thought it was because it was not sunny enough in my window. Fast forward to my first garden center job. It was by accident that I was asked by my parents neighbor to help at his start up garden center. He put me in charge of the store and the task of keeping house plants alive took on a new importance. I was instructed to water the plants each day, nothing else. Turns out the owner knew little more than me about them. When customers asked questions concerning the care of the plants I didn't have any answers. I started by reading the tags the growers provided with the plants and started memorizing the names. Then I started reading the books the garden center had to find answers to their questions. The books explained that roots needed air so it was good to let container plants dry out before watering again. Hmmm! The books suggested “feeling the soil” with an index finger to make sure the soil was dry. No problem! The books explained a way of observing plants and their environment to better care for them. Lo and behold, the plants survived. Even the ones that were looking grim sprouted new growth and looked marketable again. Wow! So simple. The most common cause of plant death is over watering followed closely by under-watering. There are exceptions but, in general, if a plant can be allowed to dry out in-between watering events, it will have a chance at survival. Watering restraint is the first step toward growing success. Of course, plants grow better if the watering is regular and the amount of water is sufficient to leak out of the drain hole in the bottom of the pot. They also do better if they are given some fertilizer from time to time. House plants are a lesson in “controlled neglect”. The control you exact will be the determining factor in achieving your objective. The plant growth continuum can range from slow/little growth to fast/lots of growth. Slow growth is achieved by low light, low to no fertilizer, watering when dry. Fast/Lots of growth is achieved by higher light, more fertilizer, watering when dry but it may need it more often due to increased light. Both ends of the continuum are acceptable. You can decide where on the continuum you want your plants to reside. My daughter called me one day from her new job. Her boss had put her in charge of caring for an African Violet given to her by a vendor. She told me it looked like the plant was dying and wanted to know what she needed to do to bring it back to life. We had the conversation about watering, we talked about removing the dead leaves and I also suggested she give the plant a little fertilizer. She named the plant Audrey, after the Little Shop of Horrors, and proceeded to water her only when necessary. She pruned off the dead leaves and put it in a north facing window and she waited. One day she saw new growth forming. Next she saw buds. She was absolutely thrilled when the buds swelled to flowers and she was able to see Audrey in all her regal splendor. Her flowers were purple! Audrey produced flowers, one stalk after another for the next few months. My daughter felt a sense of pride when others noticed Audrey's flowers. 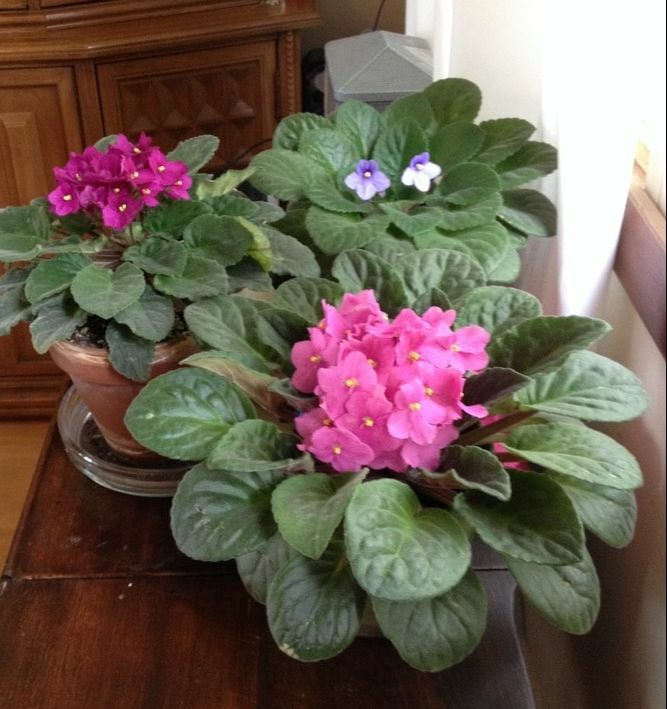 It wasn't long after that she added two more African Violets she named Linda and Bob (a Bob's Burgers reference) to the windowsill family and not long after that the three of them needed new pots all around. When house plants do well it is enormously gratifying. If you are their caretaker in any way, shape, or form there is a sense of pride when they do well. House plants encourage the scientist in everyone. It is an opportunity to observe “cause and effect” in the privacy of your own home. No one will comment, no one will criticize and the results of your experimenting may actually surprise you one day. You may actually see flower buds forming or a new growth spurt and while it may not create a reason big enough to take the family out to dinner to celebrate, it will provide you with a reason to smile.